Imagine a situation where you need to capture twenty winks in the middle of a super-long download. Staring at the computer screen for the whole day has taken its toll on you and you desperately need a break. Or you just need a shrill sound to remind you of tasks to do. It would be a good idea to get your hands on this simple, free and cross platform web-based alarm clock, MetaClock. Unlike other online alarm clocks, MetaClock serves a few more functions than just as a wake up call. Users can set some notes to remind them of tasks to do when the alarm is triggered. 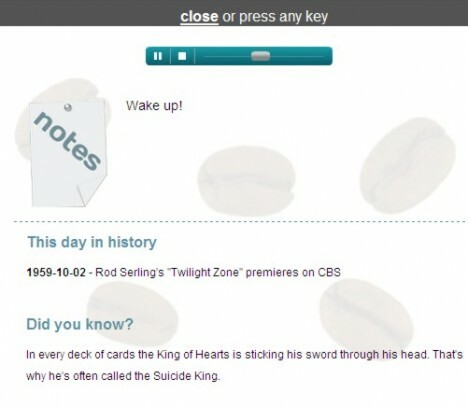 The “Show Today in History Facts” and “Show Random ‘Did you know’ Facts” will also brighten monotonous or dull moments with general knowledge facts displayed on the screen when the alarm clock rings. Users also can set some sites to be prompted when the alarm is activated. For instance, users can enter interesting YouTube videos URL in the relevant fields and users will be prompted the video clips when the alarm is ringing. In other words, MetaClock allows programming with the alarm clock for desired events to happen preceded by an alarm tone. Of course users are free to customize the time setting and choose the desired alarm tone from a list of tones given. The setting is pretty straightforward and no installation or registration is required. Users can easily stop the alarm by hitting any key at the keyboard.